"Key Chains are actually an option for the many types of custom pins that we offer. No, they are not a pin, but they are available in all the various pin types." What is a Custom Made Key Chain? 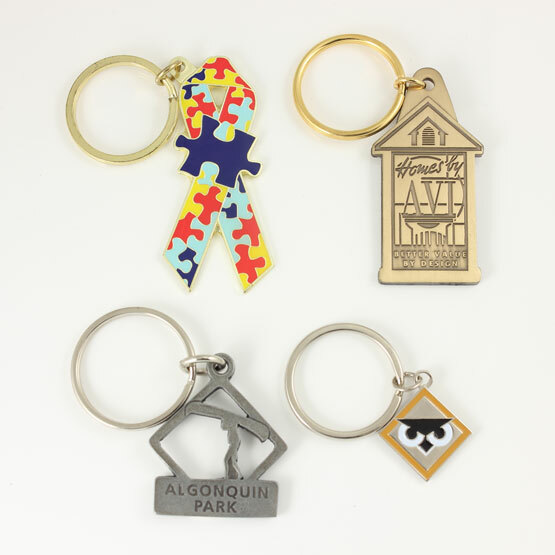 Whether you’re looking for a unique promotional giveaway, or a fund-raising tool, a custom made key chain could be your best option. A key chain is one of the few things that you know someone will carry around with them at all times. We have found that a good custom key chain usually finds some keys that call it home. With 51 years experience in the industry, KingPins is your home for custom key chains. What separates us from the competition? Simple, we work with you to design a key chain that will serve a greater purpose than holding keys; our custom key chains will also carry your message for many to see. Our expert sales staff will work with you to come up with a custom key chain specifically for your group. We consider your wishes in the designing process and your budget is always taken into account. Since the creation of keys there has been a common problem; keeping tack of where we put them. The invention of the key chain gave people an item on which to connect their keys so they could keep better track of where their keys are. A key chain is a small chain that is made of metal or plastic that connects to a ring which holds keys together. People often use key chains to carry things other than keys, items like whistles, bottle openers and car alarm remotes are also commonly connected to the chain. In addition to being a great way to safely store keys, a key chain’s ring ensures that keys do not get twisted when in use. Key chains are an important tool for security officers, cleaners and others who need to frequently need access to keys. Computers have added a modern spin on key chains. USB keys can usually be found attached to a key chain. These are data storage device used to transfer information, the small size of these devices makes a key chain a perfect home for them. Discover why Kingpins Custom Key Chains are the best choice for many people. KINGPINS offers the best pricing for Custom Key Chains. Yes, they are a premium but due to our high volume, we can pass on to you the best prices possible. KINGPINS uses an epoxy dome for extra protection. All types of custom designs and finishes are available. KINGPINS Custom Key Chains gives the recipient an opportunity to view your logo every day and remind them of your service. KINGPINS offers the highest quality Key Chains. Available in any shape or size you wish. How are Custom Key Chains Made? The process of making a custom made key chain is made simple by our experienced sales and design staff. You may be surprised to find out that there are a lot of options when it comes to creating a key chain. There are a wide range of sizes, cuts, colors and more. We are able to walk you through any project. We are more than happy to explain to you how we can put your existing logo on a custom key chain, or we can design one from scratch with you. Keys from all over the world have found a place on key chains we have created. If your group is thinking about creating custom made key chains, we want to talk to you. Our sales representatives are experts at working with you to learn about your needs. It doesn't matter if your key chain is a gift to clients, or you want an interesting fund-raising tool, KingPins is here to help. You can use our online ordering to get started right now. You can also email Nicole at nicole.allen@kingpins.net, or give us a call at 888.278.1668 and tell us about your custom key chain needs.